Love at first sight and love at first bite. Engage and excite all of your senses when you celebrate Valentine’s Day at our iconic New York City locations and savor our chefs’ special menus. 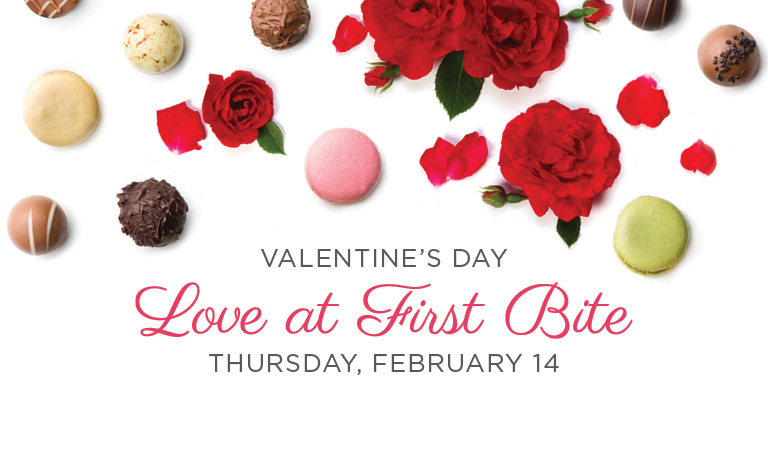 When you reserve your romantic Valentine’s Day dinner with us, you’ll also receive a delectable bite-size dessert, handcrafted by our pastry chefs, to take home following your unforgettable dining experience. Chef Andy Bennett offers the highest quality, freshest seafood prepared in impeccable style in our spacious, elegant dining room, overlooking The Rink at Rockefeller Center. With a view that is guaranteed to impress, Rock Center Cafe is an iconic destination, serving exceptionally prepared American cuisine, just a few blocks from the Theater District. Indulge in vibrant Spanish cuisine, including oysters, Ibérico ham, and crema catalana in our elegant main dining room. Share Chef Jarett Appell's special Valentine's Day menu for two while enjoying romantic views of the Empire State Building. For a classic date night, start with a menu full of aphrodisiacs before going up and experiencing the breathtaking 360° views from the heart of New York City. An elegant Parisian brasserie found in the landmark MetLife Building has a Valentine's Day menu of French classics. The best-kept secret in Midtown! Overlook Lincoln Center’s reflecting pool while enjoying Chef Shea Gallante’s authentic Italian masterwork at Lincoln, with a special Valentine's Day menu. Chef Morgan Jarrett's Valentine's Day dinner experience features romantic Lily Pond views and exclusive evening access to the Bonsai Museum. Located inside The Metropolitan Opera, the Grand Tier is one of the most romantic spots in New York. Dine with us before you enjoy a show at Lincoln Center or reserve for later in the evening. Late night, date night at Nick & Stef’s, right next to Madison Square Garden. Offering a special 8pm and later menu featuring oysters, braised short rib, filet mignon, and signature sides. Brasserie 8 ½ is a classic, stylish French brasserie located just steps from 5th Avenue. Enjoy beloved classics with a light, innovative touch, in our stunning dining room, featuring original artwork by Leger, Matisse and others.